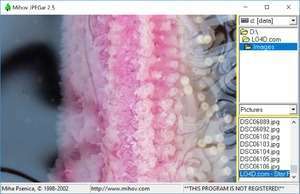 Mihov JPEGar is a very simple image and slideshow viewer with support for the most basic, and limited number of different image formats such as bitmaps, jpegs, icons, pngs and gifs. It may be suitable as a replacement default previewing program for that which is used by Windows, though not recommended. This program has seen very little updates for around a decade. Mihov JPEGar 2.5 is a shareware program and can be used as a demo to try the software until the free trial period has ended. A full version of the program is available after the trial period ends. For security reasons, you should also check out the Mihov JPEGar download at LO4D.com which includes virus and malware tests. Additional screenshots of this application download may be available, too.